ABOUT: ...Walter Jackson left [Estes & Lauriat] in March 1898 to give all his time to the Grolier Society, selling out his interest to Estes and Frederick. This brought a change in imprint to Dana Estes & Co., with the retail division operating separately as the Charles E. Lauriat Co.... The new Estes list was much like the old one -- that is, the fine arts, travel books, deluxe editions and children's books.... [Estes died June 1909]... The house appeared to change little ... until abruptly in 1913, for reasons still unclear, there was such a sudden drop in both quantity and quality of the Estes list that in 1914 no one was surprised when it was acquired by the L.C. Page & Company for a bargain price. (Tebbel). 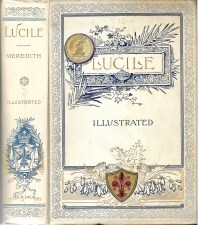 No copies of the Estes & Lauriat "Holiday" edition of Lucile with a Dana Estes & Co. titlepage are known. Since Dana Estes & Co. continued Estes & Lauriat, it seems likely that the edition printed and bound in 1894 simply continued on sale until out of print in 1906. 1898 PTLA. Repeats blurb and cut from 1894-1897 Estes & Lauriat catalogs: A handsome holiday edition of Owen Meredith's masterpiece, printed from new, large type, in a fine open page, and illustrated with twenty magnificent full-page plates in photogravure from landscape views and authentic photographs of the scenery and localities mentioned in the poem, and a charming ideal picture of the heroine by W.L. Taylor, reproduced in photogravure as a frontispiece. Imperial 8vo, handsomely bound in cloth, with original cover design, with slip cover, in a neat cloth box. $4.00. [Same cut as Estes & Lauriat, 1894-1898]. 1906-1914 PTLA: "Miscellaneous and Gift Books" section of the list of "Books Out of Print for 1906" includes "Lucile. By Owen Meredith. 1 volume, cloth, 8vo, boxed."